Fall has officially arrived. In the Atlanta area we may still get days with bright, warm, sunny weather but your landscaping whether it shows it or not, knows that the season is changing. Complete aerating, over seeding and fertilizing fescue lawns. Fertilize trees and shrubs with a balanced fertilizer. Continue installation of fall color. For those looking ahead this is also a great time of year to plant new trees and shrubs as well as bulbs for spring flowers such as tulips. But many people find October the time for outdoor decorating. 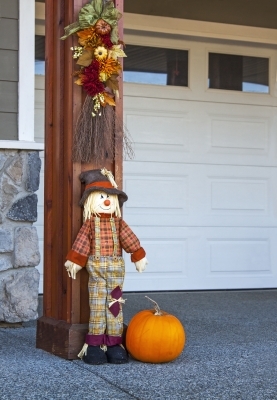 Many people use the holidays of Halloween and Thanksgiving as the theme for outdoor decorating with pumpkins, wreaths, and even lawn inflatables. The internet, including Facebook and Pinterest are filled with ideas and DIY tips for those looking to utilize their skills in the yard this time of year. Hutcheson Horticultural is here to assist you with any of your October or year round landscaping needs. From seasonal trimmings and cleanups to installation of seasonal color we do it all and would love to speak to you about your landscaping needs. You can reach us via phone at 770-924-1001 or use the “Contact Us” feature on our website.